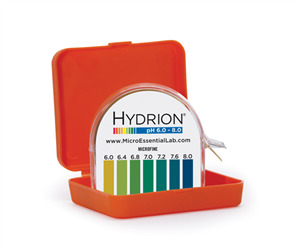 This short-range Hydrion MicroFine pH Paper measures pH solutions in the slightly acid, neutral, and slightly alkaline range of 6.0-8.0 and offers clear bright single color matches at every .4 to .2 interval. Hydrion MicroFine pH Papers are ideally suited to testing minute amounts of solution, only requiring 0.0001ml.for an accurate measurement. With a width of 5/32"", Microfine pH Paper also fit easily into small tubes. Each carton contains 10 kits, each consisting of two(2) 15-foot rolls of ph paper, packed in a protective Hydrion dispenser with matching color chart, and a polypropylene case.